Fishes of the class Chondrichthyes are commonly referred to as the ‘cartilaginous fishes’ as they have skeletons made of cartilage, unlike most other fi shes whose skeletons are made of bone. However, parts of the skeleton and the jaws in particular, may be calcifi ed to produce stiffer and stronger structures. The class comprises the Holocephali (chimeras,ghost sharks, elephant fish, silver sharks and ratfi sh) and the Elamobranchii (‘true’ sharks and rays), with the true sharks of Australia represented by 27 families in eight orders (see Last and Stevens, 1994; Compagno, L.J.V., 2001). Worldwide, there are about 1200 known species of sharks, rays and chimeras, making up about 5 percent of all fi sh species. Australia is fortunate in having a particularly rich chondrichthyan fauna, with about 300 species currently described. Of the 370 extant shark species worldwide, almost half (170 species) can be found in Australian waters. Nearly all live in the marine environment with few able to tolerate the brackish lower reaches of rivers. The bull shark (Carcharhinus leucas) is however commonly found in estuaries and rivers in tropical and warm temperate regions, and Glyphis spp. may penetrate many kilometres up certain rivers of the northern part of Australia. large geographical area sharks can be found living in a broad variety of environments. In the open ocean some are pelagic, living their whole lives in upper and middle waters, while others are more benthic, living on or near the ocean floor, as are many species associated with the continental slope. Coastal and shelf waters offer a wide range of habitats in terms of depth, water conditions (e.g. temperature, turbidity, salinity, dissolved oxygen) and substrate (e.g. coral reefs, rocky reefs, sand, mud). Some shark species have very narrow, preferred habitats, whereas others are able to utilise a range of different habitat types. Species within each of the 27 Australian shark families have fairly similar body forms and, as morphology effectively determines a shark’s ability to exploit the environment, sharks within each family tend to play similar roles in the ecosystem. For example, mako sharks (Isurus spp.) with their streamlined, torpedo-shaped bodies, are generally able to swim relatively fast and with energetic economy. They can move large distances and can prey on a wide variety of marine fauna (in particular teleost fi shes) with their large, powerful jaws and teeth. Sharks with dorso-ventrally fl attened body forms, such as wobbegongs (Eucrossorhinus, Sutorectus and Orectolobus spp.) are adapted for a demersal life-style using cryptic patterning and colouration of the body surface as camoufl age in their sit-and-wait predator role. invertebrates, TL ≈ 2.5; teleost fishes and cephalopod molluscs, TL ≈ 3.2; and marine mammals, TL ≈ 4.0)]. 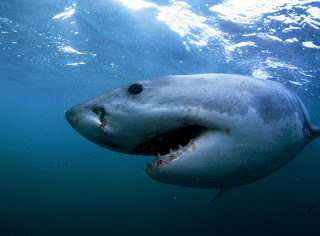 The great white shark (Carcharodon carcharias) has the highest trophic level (TL = 4.5) due primarily to marine mammals making up about 20 percent of its diet. At the other extreme, the zebra shark (Stegostoma fasciatum) that feeds exclusively on molluscs has a trophic level of 3.1. So, while all sharks are higher-level predators they are not all true apex predators. The answer is, however, uncertain. It is recognised that removal of top predators in terrestrial and marine ecosystems can cause a ‘top-down’ effect on organisms at lower trophic levels. This has been clearly demonstrated in the case of the kelp forest ecosystems of the North Pacific Ocean where sea urchin populations increased as the populations of sea otters (a major predator of urchins) declined due to commercial exploitation. The increased abundance of algae-eating sea urchins promoted a decline in the kelp forests, changing the whole local ecology. In the North Atlantic the over-fi shing of cod (Gadus morhua) stocks resulted in a dramatic population crash and broad-scale closure of the fishery. Cod stocks have failed to recover, probably due to a fundamental change in the food web, with other ground fish now exploiting the niche that cod once occupied. In the case of sharks, it is very difficult to determine what the effect of extinction or local extirpation of species on the marine ecosystem might be. This is due to the complex nature of their environment leading to practical problems of year-round sampling and an inability to conduct manipulative experimentation with most species of sharks. It is reasonable to hypothesise that there will be a measurable effect on the community structure following removal of a shark species. The problem lies with predicting what the effect may be. For example, the loss of C. carcharias, our top shark predator, might result in population explosions of seals, sea-lions, smaller cetaceans and other shark species, based on our knowledge of its diet. Increases in those species, themselves apex or near apex predators, would probably have flowdown (or higher-order) effects that also lead to changes at the community or ecosystem level. (> 200 metres depth) fisheries either targeting chondrichthyans, or operating a mixed fi shery that impacts sharks as bycatch, are operating without a good understanding of shark species ability to withstand fishing effort. Species may be extirpated before we even understand their role in these ecosystems. In addition to fishing pressures, there are other, anthropogenic factors that may produce population declines, including habitat modification or destruction, and pollution. These effects tend to occur in the coastal environment, linked to urban growth along our coastline. While limited in geographical terms, these factors may have a disproportionate effect on some shark populations, as many species utilise inshore, shallowwater environments as birthing and/or nursery grounds. High mortality of newborn and juvenile sharks has the potential to disrupt inshore communities and poor recruitment through to maturity may have ecosystem level effects. Incidental removal of apex species that play an important role in food-web structures, irrespective of the means, could lead to cascading ecological changes. Importantly, the Australian Government launched (May 2004) its Shark-plan as part of the International Plan of Action for the Conservation and Management of Sharks (www.daff.gov.au/sharkplan), which should help to ensure the long-term sustainable use of Australia’s shark populations. An understanding of the role of a particular shark species in the ecosystem requires fundamental information about its life history. One also needs to know how sharks interact with other species on a temporal (e.g. tidal, diurnal, seasonal) scale. For most sharks their role in the ecosystem will also change over the course of their life, with the largest changes probably occurring during the period of growth up to sexual maturation. Unfortunately, we know relatively little about the biology of many Australian sharks. For instance, Last and Stevens (1994), in their identifi cation guide to sharks and rays of Australia, listed 32 catsharks (Family Scyliorhinidae) of which little is known about the biology of at least 20 of these species. Geographic and bathymetric (depth) distributions are available for most shark species (Last and Stevens, 1994), although this information is being constantly revised as a result of continuing shark-related research. These data inform us about the broad distributions of different species, but fail to inform about the preferred habitats, possible movement patterns, population sizes, or other important factors that would assist in determining their role in the ecosystem. The use of various tagging methodologies does, however, provide some of this information. Standard tagging involves the insertion of a tag bearing a unique identification code into a captured shark and its subsequent release. If recaptured, information on the shark’s growth and gross movement can be determined. More modern technologies involve the deployment of electronic tags that allow the position of the shark to be determined. This can be on a fi ne scale, using acoustic telemetry (ultrasonic ‘pinger’ tags that can be followed using a hydrophone system in a boat) or on a coarser scale by using archival tags. Archival tag data, once recovered, allows largescale movements such as migration patterns to be established. Both methods are currently in use to help understand the biology of the grey nurse shark (Carcharias taurus) which is critically endangered on the eastern coast of Australia. The costs associated with each technology effectively limit scientific investigations to ‘key’ species. extreme with a large zooplankton component to their diet. At the other extreme sit the great white shark and the broadnose sevengill shark (Notorynchus cepedianus) that feed on a range of invertebrates and vertebrates, and include a high proportion of mammals in their diet. Feeding strategies also show considerable variation. The megamouth shark and whale shark are both massive sharks, growing to over 5 metres and 12 metres respectively, that filter-feed, swimming with mouth agape fi ltering food from the water as it passes over the gills. are fast swimmers with ventrally placed mouths and relatively large teeth. This combination allows them to feed on a wide range of invertebrates and vertebrates, particularly teleost fishes, rays and other sharks. Dietary analysis lies at the core of understanding the possible role of sharks in their environment. There have been many studies of the diets of sharks, each based on identifying the stomach contents of individual fish. Studies clearly show that many species exhibit ontogenetic shifts in diet, presumably 4 reflecting a changing ability to capture and ingest prey items as the shark increases in size. For example, in the small, reefdwelling epaulette shark (Hemiscyllium ocellatum) of Heron Island Reef, Queensland, juveniles predominantly eat worms, whereas adults favour a diet containing a greater proportion of crabs and shrimps, perhaps reflecting a better ability to deal with hard-bodied prey. Similarly, a study in Shark Bay, Western Australia, clearly shows shifting diets in four elasmobranch species with increases in body size, and evidence of resource partitioning between elasmobranch species occupying the same habitat. While these studies inform us about what sharks prey on it does not provide insight into the effect of their presence in the ecosystem. It allows us to infer what the effect maybe–for example, a species feeding exclusively on one speciesof crab may be inferred as having an influence on that crab’s population–but without some form of manipulative experimentation it remains uncertain whether there is a significant effect. Another difficulty is exemplified by the observation that one species of elasmobranch may exhibit grossly different diets, not only related to its size, but also to its locality. In an area with a mud substrate worms might dominate the diet, but in another area, with a sand or rock substrate, it may be dominated by crabs or teleost fishes. Sharks may be specific about what they eat, searching out a particular prey group, or they may be opportunistic, feeding on whatever they find. In the fi rst case the diet will be unrepresentative of the community structure compared to the latter case. The observation that a species can shift its diet makes interpretation of its role in the ecosystem difficult. We are only starting to understand the plasticity of dietary composition. Many of the pelagic species, such as the whaler sharks (Family Carcharhinidae) are fast swimmers with ventrally placed mouths and relatively large teeth.